The global technology landscape is changing faster than many Western technology companies believe. The shift is driven by China and other pockets of innovation around the world. Five years from now, many of the most influential global companies will be from outside of the United States. Change is inevitable, and China and other countries are not slowing down. At a time when the US needs to be focused on transforming and leading the world, the US leadership is focused inward and seems content to allow American technology companies to stand on their own without providing any clear support or direction. 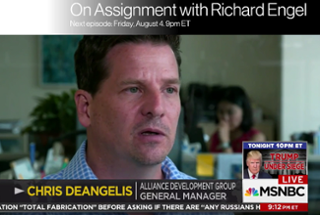 Last week I had the honor of sitting down with NBC's Richard Engel to talk about this important topic. I hope you will take ten minutes to watch and help the US become a world's leader in innovation again. Watch On Assignment with Richard Engel from NBC News. China's growing role in the global economy is inevitable and brings with it emerging opportunities for Western companies. I hope you will come to China and experience it first hand. I had the opportunity to visit a new person-less trial store in Shenzhen last week and try it out the day before it went live. My sense is that the store will be convenient as a place for a late night crowd that needs to get some basic items but it is not yet an amazing experience. The system required scanning a QR code to get in and going to my WeChat or Alipay app several times throughout the experience. It wasn't difficult but given the choice - it wasn't yet as convenient as a regular store. And if the store senses you haven't paid, the exit door won't unluck which could cause some problems. Alibaba Hires Top Scientist to Mastermind AI Drive - China Daily - Alibaba, Baidu, Tencent and others are placing major bets on AI. Meet up with our Managing Director, David Sullivan at Mobile World Congress Americas in San Francisco. A veteran of 10 MWCs in Barcelona, David is excited to have MWC in the US and hopes its the first of many. Want to set up a meeting with David to talk about the China opportunties? Email him here. About ADG: Since 2001, ADG has been helping enterprise and consumer technology companies build and execute strategic initiatives in China and Asia. Learn what ADG can do for you.